Home » Drug Interactions » Can I take Advil and Mucinex together? What is Advil? How it works in the body? Advil is a Brand name for a nonsteroidal anti-inflammatory drug (NSAID) that contains ibuprofen as active ingredient. Chemically it is derivative of propionic acid. Advil works by inhibiting prostaglandins, chemicals that may cause inflammation in the body. Advil is used to for alleviating fever, and to treat pain or inflammation caused by various conditions such as headache, toothache, arthritis, menstrual cramps, back pain, or minor injury. It is an OTC product that can be bought without prescription. It is available in capsule, oral suspension, tablet, chewable tablet and extended release tablet forms in doses of 200, 400 and 600 mg and 100mg/5ml as a suspension. FDA approved ibuprofen in 1974. Advil is contraindicated for use in children younger than 6 years of age. What is Mucinex? How it works in the body? Mucinex is an expectorant drug that contains guaifenesin as an active ingredient. This medicine is helpful in reducing chest congestions caused by colds, infections or allergies. Mucinex works by thinning the mucus in the airways. As an expectorant drug, Mucinex increases the output of sputum and bronchial secretions by reducing adhesiveness and surface tension. The increased flow of reduced viscous secretions promotes ciliary clearence and changes a dry, unproductive cough to one that is more productive and less frequent. 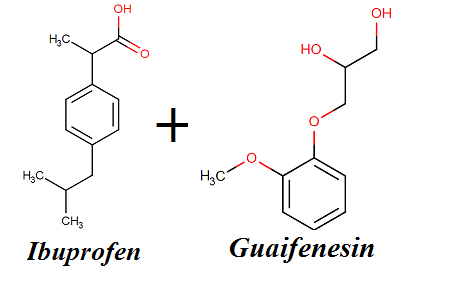 By reducing the viscosity and adhesiveness of secretions, guaifenesin increases the efficacy of the mucociliary mechanism in removing accumulated secretions from the upper and lower airway. While Mucinex can easy symptoms, it is unable to treat the cause of congestion. Mucinex is available in tablet, granule, and solution and liquid from. As a tablet it is available in doses of 600 and 1200 mg. As a solution and liquid it is available in dose of 100mg/5ml. FDA approved guaifenesin in 1952, and today is manufactured by Reckitt Benckiser. As OTC products, both Advil and Mucinex are available in fixed-combinations with different active ingredients into one dosage form. Advil OTC product that contains only ibuprofen as an active ingredient and Mucinex OTC products containing only guaifenesin as an active ingredient can be taken together safely because there is no direct interaction between these two drugs. Can I take Advil cold and sinus with Mucinex D together? Thus Advil cold and sinus and Mucinex D should never be taken together. Can I take Advil Congestion Relief and Mucinex Fast-max Cold and Sinus? Thus you should avoid combination of these 2 medicines. Can I take Advil Allergy Sinus and Mucinex Fast-max Day Time Severe Cold together? Patients with gastric or duodenal ulcers, gastritis, GERD, internal bleeding, patients who are on anticoagulant therapy (e.g. warfarin or heparin) should avoid these combination since they both contain NSAID drugs. Advil Allergy Sinus ibuprofen as an active ingredient while and Mucinex Fast-max Day Time Severe Cold contains acetaminophen. This combination should be avoided in such patients. Can I take Advil PM and Mucinex Day Time Severe Cold together?